Hailing from Syndey, Vinnie Calabrese was introduced to snooker from an early age, as his father ran a snooker club and both he and his brother were promising juniors in the game. It was Vinnie who impressed the most however, and Calabrese has a strong CV at national level, winning at under 12’s 15’s 18’s and 21’s level, while he also claimed the full Australian Championship at the age of just 16. It was in 2013 that Vinnie was to gain a place on the main tour, as he captured the Oceania Championship in Papua New Guinea with a 6-5 victory against countryman Matthew Bolton. “This has been a dream and something I’ve been working towards since I started, but the hard work really begins now. I have to win a lot of matches in the next two years to secure my spot and stay on the tour. During the first half of his maiden professional season, Vinnie struggled for results, but his best result was to come at the ET3 event in Doncaster. There he defeated Mark Selby, Dechawat Poomjaeng and David Morris to reach the last 16, where he let slip a 3-0 lead, losing 4-3 to Jimmy Robertson. There was also to be a notable win at the year-ending UK Championship in York, where he defeated Welshman Dominic Dale in a deciding frame, before losing to Gary Wilson in the second round. Just one further victory would follow during the second half of the campaign as he defeated Thailand’s Noppon Saengkham at the World Championship qualifiers, before he lost out 10-4 to Jamie Burnett. Vinnie was to struggle during 2014/15 as he won just two matches, before taking the decision to resign his tour membership following the Welsh Open, in order that he could enter the Oceania Championship and try to earn a fresh tour card from the start of the following season. 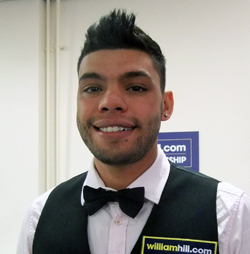 Though a controversial decision, it was one that would pay off for Vinnie as he did indeed go on to win the event, thus earning a new two-year tour card from the start of the 2015/16 season.